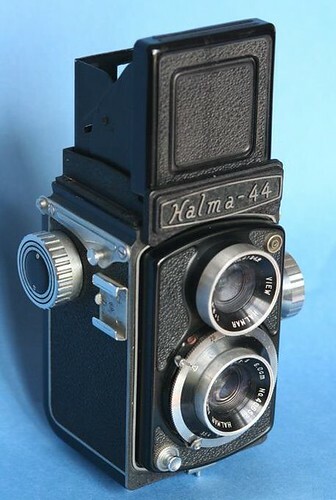 The Halma 44 is a Japanese 4×4 TLR, perhaps made around 1960 by a company called Hara, successor of Lustre. Two versions exist, with manual or automatic film advance. 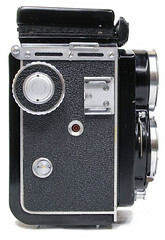 The camera was also sold as Prinz 44 or Tower 44B. The Halma 44 has the classical TLR shape and a predominantly black finish. The front standard moves back and forth for focusing. The focus knob is on the photographer's left, and contains a film reminder. The distance scale is engraved in both metres and feet, and there is an additional plate giving depth-of-field indications. The advance knob is on the photographer's right, and there is an accessory shoe on the same side. The viewing hood contains a sports finder and a large magnifying lens, and the viewfinder has a Fresnel screen. The release button is placed at the bottom of the front standard, on the photographer's right. The shutter is cocked by a small lever and there is no double exposure prevention. There is a PC synch socket buried at the top of the front standard, on the opposite side. The back is locked by a latch at the bottom, moved by a knob surrounding the tripod thread, with O and L indications and the word JAPAN. The manual model has film advance by red window and no exposure counter. The strap lugs have an incurved shape and are held by two screws. The nameplate has an almost rectangular shape, with convex top and bottom line; it is inscribed Halma–44. 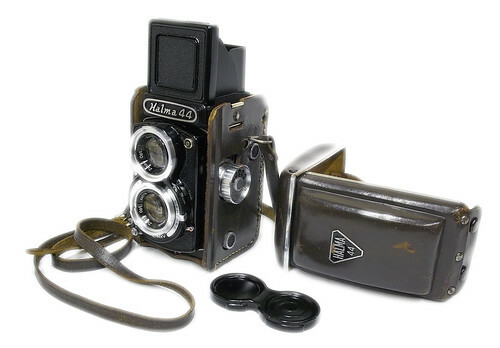 The taking lens is a Halmar Anastigmat 6.0cm f/3.5 and the viewing lens is a View Halmar 6cm f/3.5. Both lenses take simple push-on filters. Taking lens numbers are known from 40652 to 44490, and viewing lens numbers have been observed in the 41xxx range. On all the examples seen so far, the shutter has B, 25–300 speeds and a plain black front plate. At least one recent source reports the shutter as a CHY-FB, but this is unconfirmed. Manual Halma 44, Halmar Anastigmat and View Halmar 6.0cm f/3.5 lenses. 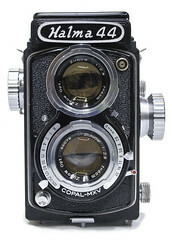 The manual Halma 44 appears in an advertisement published in Camerart (a Japanese magazine in English language), perhaps in 1960. This advertisement was inserted by Tohko Co., Ltd., certainly the distributor of the camera, and also presents the Halma Flex, Halma Auto and Owla Stereo. The description says that the camera has manual film advance and a "Prontor type" shutter giving B, 1–300 speeds, perhaps a mistake for B, 25–300. The speed range cannot be distinguished on the picture, which shows no difference from the examples observed so far. Semi-automatic Halma 44, Zunow 6cm f/2.8 lenses (taking lens no.66078). The semi-automatic model was called Halma Semi-Automat 44. It has a round exposure counter window near the accessory shoe. There is still a round red window on the left of the back, protected by a vertically sliding cover. It is only used to set the position of the first exposure. The advance mechanism is engaged by a sliding button placed below the advance knob. The mechanism is unlocked after each exposure by pressing the centre part of the knob. 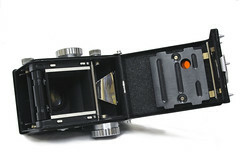 There is a large feeler roller inside the camera, under the exposure frame, and a small tension roller attached inside the back, on the bottom part. The strap lugs differ from those of the manual model: they have a straight shape and are attached by three screws. The film flanges slightly differ too, with four milled rows instead of five. The nameplate has an oval shape and is inscribed Halma 44 with no hyphen and a different font. 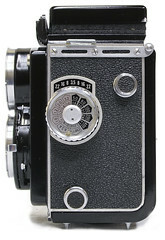 The shutter is a Copal-MXV (B, 1–500), contained in a black casing. It is separately cocked by a lever on the photographer's right, with a green dot. The M/X selector is placed on the other side, above the aperture scale. The self-timer lever has a red dot and protrudes under the aperture index. The lenses are Zunow 6cm f/2.8; the taking lens has four elements and a serial number, whereas the viewing lens has no number and is perhaps a triplet. Both have a bayonet attachment for filters or a hood. The lens numbers observed so far are in the 64xxx to 66xxx range; the lenses are the same as on the Walz Automat 44 and certainly share the same number sequence. Tower 44B, Kinokkor 6cm f/3.5 taking lens no.59119, View Kinokkor 6cm f/3.5 viewing lens no.59062. The Tower 44B is a name variant of the semi-automatic Halma 44, distributed by the US company Sears, which was also selling the Tower 44 made by Tougodo. The Tower 44B differs from the semi-automatic Halma 44 by the lens and shutter equipment. The Kinokkor and View Kinokkor 6cm f/3.5 lenses are the same as on the Toyoca-44 and Tower 44. Taking and viewing lens numbers are known in the 59xxx or 510xxx range. The shutter has the same features as the Copal-MXV, with B, 1–500 speeds, self-timer and M/X synchronization. Its silver front plate is inscribed SUPER MATIC at the bottom. The position of the controls is very similar to the Copal, but for the M/X selector which is slightly lower. 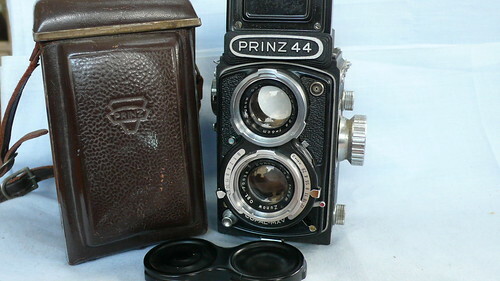 Prinz 44, Zunow 6cm f/2.8 lenses (taking lens no.70025). The Prinz 44 is another name variant of the semi-automatic Halma 44, distributed by the British company Dixons. 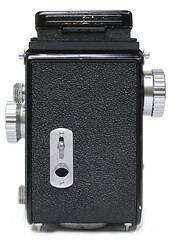 Unlike the Tower 44B, the Prinz 44 has the same Copal-MXV shutter and Zunow 6cm f/2.8 lenses as the original model, from which it differs only by the PRINZ 44 oval nameplate. The ever-ready case is made of brown leather and has a triangular PRINZ logo. ↑ Attribution to Hara: message by Koji Namikawa in this page at tlr-cameras.com, based on documents about the camera inspections for export. 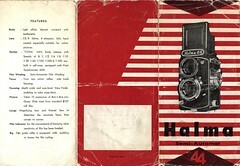 ↑ Fresnel screen: instruction manual of the Halma Semi-Automat 44. ↑ Examples pictured in this page at www.chinesecamera.net (archived), among other cameras at Cameras Downunder, and observed in online auctions. ↑ McKeown, p.376, where the manual model is called "Halma-44 (Model I)". ↑ Advertisement reproduced in this page at tlr-cameras.com. ↑ 6.0 6.1 Instruction manual of the Halma Semi-Automat 44. Anonymous company. Halma Semi-Automat 44. Instruction manual reproduced in this Flickr set by Rebollo_fr. 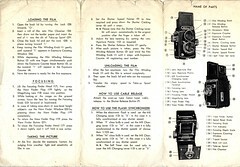 McKeown, James M. and Joan C. McKeown's Price Guide to Antique and Classic Cameras, 12th Edition, 2005-2006. USA, Centennial Photo Service, 2004. ISBN 0-931838-40-1 (hardcover). ISBN 0-931838-41-X (softcover). P.376. Sugiyama, Kōichi (杉山浩一); Naoi, Hiroaki (直井浩明); Bullock, John R. The Collector's Guide to Japanese Cameras. 国産カメラ図鑑 (Kokusan kamera zukan). Tokyo: Asahi Sonorama, 1985. ISBN 4-257-03187-5. Item 2119. The cameras are not listed in Kokusan kamera no rekishi. This page was last edited on 19 January 2019, at 08:59.